How do I create a digital release? Creating a digital release in Single is easy. Even still, we’ll walk you through the process. It all starts in the Single Dashboard. Select “Create Digital Release” to begin. You’ll be prompted to enter information about your release. This is the “metadata” for your album, so be sure the info you enter is correct - it cannot be changed! There are some great support articles at the bottom of your page. If you have specific questions about the topics covered, we highly recommend you check them out. You can find the rest of our artist support articles here. After you enter your album information, hit continue to move to the track upload page. Click “+ Add Tracks” to begin. Some (but not all) information on this page is required. Learn why ISCR and UPC are required in this support article. This page is where we give you the freedom to choose whether your tracks are offered individually or exclusively as part of the album. Finally, for information on how digital music is displayed in your Shopify store, take look at this support article. Once you’ve entered the required information, click “Review for Sale”. This next page will be your last chance to make any changes to your digital release. Once you’ve verified that all of your information is correct, you will have the option to “Create Standalone Digital” or “Attach to Existing Physical”. If you’d like to take your release further and attach physical merchandise, take a look at our detailed support article on creating a bundle. Otherwise, select “Create Standalone Digital” to finish up. Congratulations, you’ve created a digital release through Single Music! Pre-orders are a great way to build momentum for an album or EP release. With Single Music + Shopify, you can set digital and physical pre-orders to be automatically delivered / shipped on the release date. Scroll to the bottom and select the option for “Manually capture payment for orders”. If you make the customer aware that the product they are purchasing is not yet available (like the example on the right), you are allowed to capture payment at that time. Creating a digital release using Single is easy. Next, simply set the Presale Date to the day you would like the Release to be available for pre-purchase. If you’ve already scheduled your release and want to offer a pre-order, contact support. Releases will be delivered automatically to fans at 12am EST on the Release Date and marked as fulfilled in the Shopify Admin. If you would like to offer Instant Grat tracks with your pre-order simply set the Release Date for those tracks to the same day as the Pre-Order Date. While the Single App helps you create and manage digital releases, physical releases are created using Shopify’s admin. In order to change the “Add to cart” button text for your pre-order products, you must create a new product page template. You can read an advanced tutorial from Shopify for exactly how to do this. Otherwise, the easiest way to create a pre-release for a physical product is to include (Pre-order) in the name of the product! This is the most common way to go about physical pre-orders. How do I run test purchases on Shopify? You’ve finished creating your digital release on Single. Now it’s time to see what purchasing your music on Shopify looks like from a customer’s perspective. Start in your Shopify admin page. Go to settings and locate the “Payment Providers” section. Find “Shopify Payments” and select “Edit”. This is where you can adjust settings about how to accept payments. For now, simply select the box that says, “Use test mode” - next click “Save”. Once your settings are successfully changed, the “Shopify Payments” box should be wrapped with a yellow caution tape - this shows that you are ready to test transactions! Now it’s time to visit your Shopify store and complete a test transaction. Add items to your cart and hit checkout. Go ahead and fill out some fake shipping info. Click “Complete Order” to finish your test transaction. On your Shopify admin page, you’ll now see this test order show up next to the “Orders” tab. The “Orders” tab is where you can see information about your orders and payment status, mark orders as fulfilled, and view any abandoned customer carts. For more information regarding testing payments, including simulating successful and failed orders, visit the Shopify Help Center page. Having trouble? Talk to us. To bundle your newly created digital release with a physical product, simply select “Attach to Existing Product”. Just be sure to follow Nielsen’s official rules when creating and selling your bundles! On the “Manage Digital Releases” page you’ll see a list of your digital music and several “actions” you can take. Choose the paperclip. On the next page there is a search bar to find products in your Shopify store. Search for and select a product you would like to bundle. You will then be asked whether you would like to report a digital or physical sale with the album. Single will report accordingly based on your selection. If you select to report a physical version, select the type of physical product and enter a UPC. Once you have created your attachment queue and double-checked your UPCs, click Create Attachments. Congratulations, you’ve created a bundle! You’ll now see new sections on your View Release page detailing your sales and reporting counts! You can view these analytics at any time by selecting the pie chart icon next to each album on your “Manage Digital Releases” page. Shopify collections offer a unique way to display groups of items to customers. For example, you can create a “music” tag. All of the music in your Shopify store will be displayed in the collection, so your fans can find it all in one place. Follow these links for instructions from the Shopify Help Center. 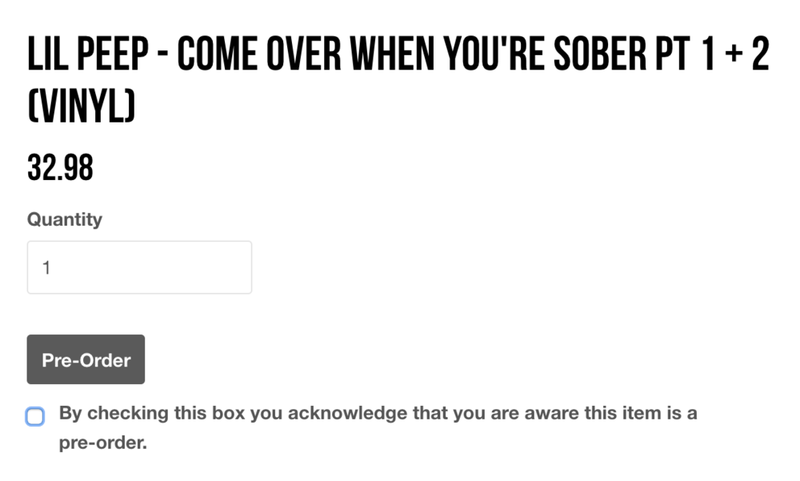 Enter Shopify conditions. These are customizable rules that you can set for your Shopify collections. The image to the right shows our first example - creating a collection for every product with a “music” tag. Note: You will see Presale and Scheduled releases in your Shopify Admin - they will not go on sale until the Release or Presale Date! When Attach to Existing Product is chosen you’ll be able to bundle or “attach” digital music to products from your Shopify Admin. With this tool you can automatically deliver digital music with the purchase of a physical product. If you need to uninstall for any reason, go to the "Apps" page in your Shopify Admin and click the trash can. Shopify offers tons of data to merchants including site traffic, customer acquisition, detailed sales insight and more. The more premium the plan, the more analytics you’ll have regarding your products, customers and how they made purchases. The most basic way to export sales info starts at your Shopify admin page in the “Orders” tab. This will bring up a list of all orders in the specified date range. Just click “Export” and choose the file type. Once you’ve downloaded the file open with a spreadsheet to view or edit. This is the process for creating spreadsheets with basic sales data. But what if you’re looking to make adjustments to your store or sales process? You’ll likely need detailed information that goes beyond just your orders. The Shopify Lite plan includes some basic analytics regarding your products and customers. You can view your overview dashboard, get a live view of your online store and access financial data. The regular plan includes all of these, plus acquisition, behavior and marketing reports. For information about reports generated from various Shopify plans, check out the comparison chart on this page. All reports are located in your Shopify Admin. Select the “Analytics” tab. This will lead you to your overview dashboard, where you can see some basic stats from your store. Many of these have a “view report” link in the top right of the block. Acquisition reports summarize the sessions that take place on your store to help you gain more customers. This information includes sessions over time, sessions by referrer and sessions by location. By analyzing where prospects are coming from, you can better shape your marketing efforts. Similarly, behaviour reports analyze what customers are doing during sessions on your site. This includes store conversions over time, top online store searches, a website cart analysis and more. Advanced shop owners who are interested in increasing average order totals or creating promotional deals will find this information especially useful. The most detailed analysis offered with the basic Shopify plan are financial reports. These are totals for how your store performed. The categories are sales, liabilities, payments and gross profits. Each of these breaks into detailed reports, just click on each to explore. Shopify makes all of your store data available for you to see - we’d love for you to improve your store or process because of this. If you’re having trouble, check out the detailed Shopify Analytics Help Page or reach out to us with questions! During installation we slyly add a few template files to your theme to make all the magic happen. Releases will be displayed like the following example after being added to your store, but will automatically assume the colors and fonts you've already chosen. You are free to edit our code at your own risk, but be advised we cannot support custom changes you make. Need some special code or help installing in a custom theme? We've partnered with the on-demand help specialists at Sixty to get you going! Book a Single expert now! Have you created a Single account, but see this message when you log in? This usually happens when the email used to sign up for Single differs from the shop owner's email in Shopify. No worries! This will not send them an email. However, when they create a Single account using that email address, they will have access to this Single Music account. Shopify Partners, Merch Companies, & Labels may have multiple stores associated with one email and thats cool with us. When installing Single in a store with the same admin email we'll merge those accounts together. You can also swap stores via the quick-select menu in the top left. Fans and Artists log in from separate places, but the same email can be used for both. We assume every artist is a fan of someone else's music. Cover art must be in the JPEG or PNG file formats and in the RGB color space with a minimum size of 1400 x 1400 pixels and a maximum size of 2048 x 2048 pixels. Do not include additional icons, download symbols, or logos as these will be encoded into the MP3. If additional symbols are necessary please edit the artwork or liquid files via the Shopify admin. Can I bulk import physical releases for reporting? Bulk tagging of physical releases isn’t currently built-in to the Single Admin, but follow these steps and we’ll get you taken care of! Open the file in Excel or some other spreadsheet software. There’s a column called “Type” that has the product type data in it. Update the values in this column with the “type” of the physical product. Why is WAV, AIFF, or FLAC required? To reduce the chances of corrupted files or poor conversion, we're going to take care of that part for you. This way you have one less thing to worry about and your fans know they are getting the best possible quality - straight from the source! For more information regarding lossy vs lossless audio quality, check out our blog post! Why are UPC & ISRC required? Short answer... organization & security. Required by SoundScan for reporting to the Billboard Charts. We do not currently offer UPC & ISRC registration for Albums or Tracks, but digital aggregators like Ditto Music, Tunecore, and DistroKid will supply UPCs and ISRCs as part of their service. Reset your password using the "Don't remember your password?" link on the login page. Do my sales get reported to SoundScan? Yes! - Single can report sales to Nielsen SoundScan. 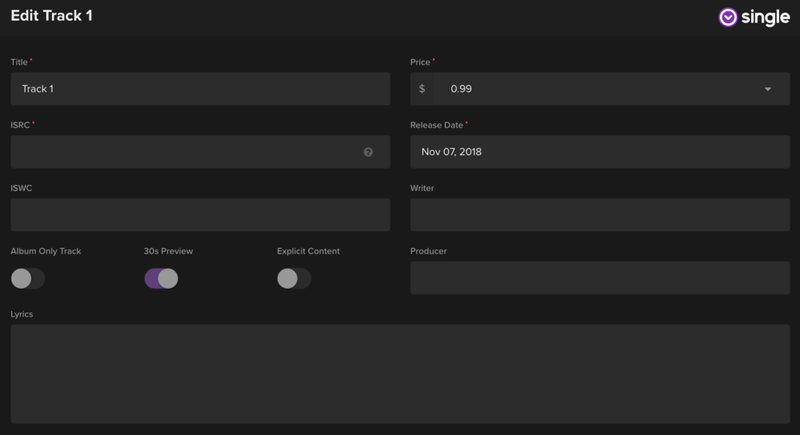 Digital Releases powered by Single are automatically reported and included in our per-track pricing. Physical Release reporting is an optional subscription and requires tagging of existing products in your inventory. Digital & Physical sales are reported automatically at 11am EST for the prior day and subject to certain criteria by Billboard & Nielsen. Physical Releases are reported upon fulfillment - not date of purchase. Simply mark the order as “fulfilled” in Shopify and our system will automatically report the sale the following day. Physical Releases shipped between Tuesday and the following Monday will be counted in the new chart week. This represents the Friday-Thursday sales week, but makes an allowance for shipping time/receipt by customers. Week 1 sales would be Tuesday 7th - Monday 13th in the example above. Digital-Only Attachments report when downloaded. Bundles containing multiple releases cannot be reported as multiple sales. When creating your bundle, select which type (digital or physical) that you’d like to be reported. Multiple Copies - If a fan purchases up to four copies of a record in the same order, each copy is reported as an official sale. Any purchase of five or more albums constitutes a bulk sale, and don’t count towards the Billboard charts.